Involvement in trade or the study of trade requires an understanding of the applicable rules and the ability to access them. When the rules become increasingly detailed and complex, however, understanding and access prove difficult. 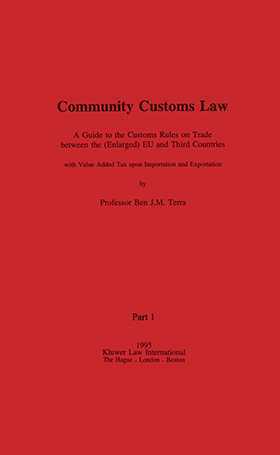 Community Customs Law brings together, in a single resource, a detailed description of the rules in force, with references to case law, preparatory texts, commentaries, and memoranda. This guide is based on the Community Customs Code (the Code'), which contains 253 Articles, accompanied by an implementing code of more than 900 Articles, 100 Annexes, and a separate implementing Regulation on relief from import or export duties. It offers an integrated discussion of the Articles of the Code and the implementing provisions. For clarity and cohesiveness, the book addresses implementing provisions under the main Article of the Code to which they pertain. It only deals with customs rules and the payment of the import or export duties as a consequence of violation, but also discusses the consequences for VAT purposes of the various customs-approved treatment or uses. Legal practitioners and businesses engaged in trade between third countries and the European Union, and academics examining these issues will appreciate the usefulness of Community Customs Law in navigating the complexities of these trade rules.